They are also experts in installing and refinishing wood on stairs, handrails, moldings, and baseboards. The superior level of quality that we are able to deliver on every job, no matter how small or large, has earned us a reputation as one of the premier hardwood flooring contractor serving Torrance. Unlike other Torrance flooring companies, Carter Wood Floors has decided to focus strictly on wood floors--specifically, on-site sanding, staining, and finishing raw hardwood. While this labor-intensive work is often avoided by our competitors, we welcome it. That's because working with raw or unfinished wood offers the greatest degree of customization and makes it possible for us to custom fit the wood so it fits a floor exactly (allowing room for expansion). It's also ideal for those who need a new floor or staircase to match existing hardwood flooring, want medallions or inlays, or wish to replace a portion of their floor, such as a few wood boards. To ensure that your new hardwood floor meets your precise functional needs and aesthetic preferences, call Carter Wood Floors today. 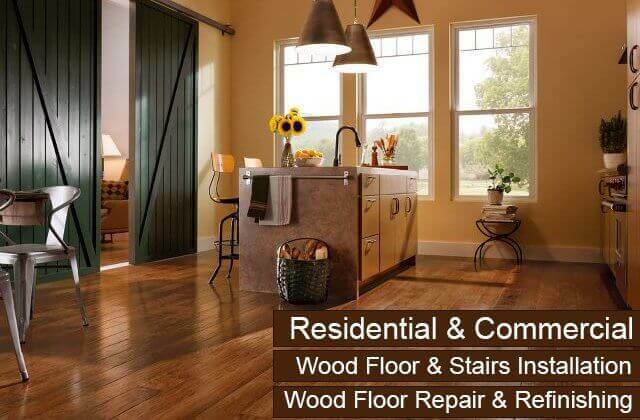 We have worked exclusively with wood flooring for over 30 years and have the expertise and skill to provide Torrance home and business owners with hardwood floor installation, refinishing, restoration, and repair services of unrivaled quality. We're bonded, insured, and licensed, and back all of our work with a one-year warranty. 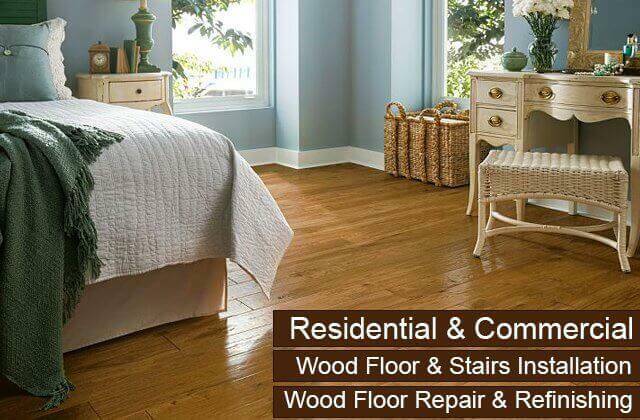 Professional flooring consultations and price estimates are complimentary and provided on site. 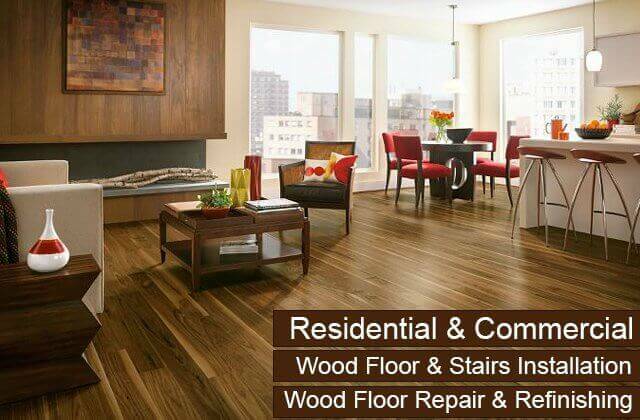 Carter Wood Floors' team will put every effort into providing you with the most thorough and skilled hardwood floor refinishing services you can get in Torrance. 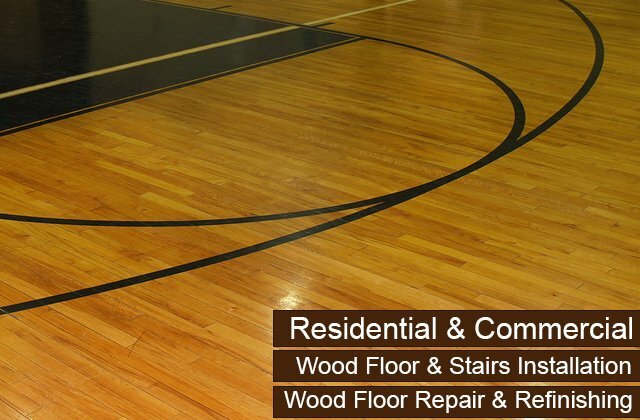 Our wood floor refinishing service consists of removing any carpeting and residual finish; sanding with three different grades of sand; buffing with a 100-120 grit abrasive screen; cleaning and removing dust and grit from the floor; and then staining and finishing with adequate drying time between coats. The majority of the work is done on the first day, but because of the time needed to cure each layer of finish, the entire refinishing job will likely take at least two days. While there are many tutorials that will show you how to refinish your wood floor on your own, it is best to leave it to the professionals. Not only is the sanding process labor intensive, but staining can also be surprisingly tricky. Staining must be done really well as to not leave any marks and then left to dry for a specific amount of time to get the desired results. By having the experts at Carter Wood Floors refinish your hardwood floor, you'll get exceptional results each and every time. 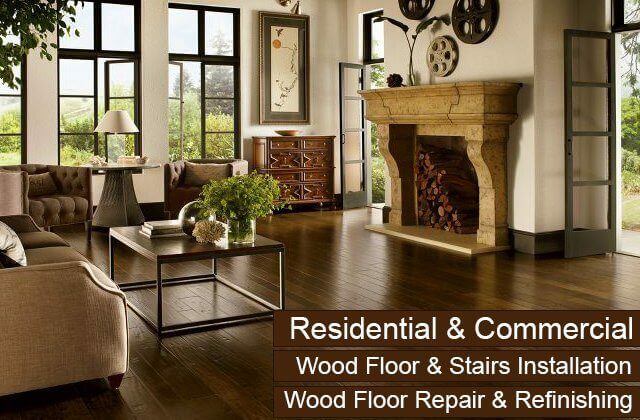 Call today to have your wood floor in Torrance restored to its natural beauty at a fair and competitive price. Carter Wood Floors can help you acquire gorgeous, long-lasting hardwood floors for your Torrance home or business at a cost-efficient price. We have been selling and installing hardwood floors for 33 years and have the experience and expertise to help our clients choose the right wood for their needs and budget. We offer free onsite consultation services where we let our customers consider first-hand how each flooring sample looks within their space and interacts with their decor. We also make sure that they are aware of the various pros and cons of all the different types and styles of wood flooring available to them. 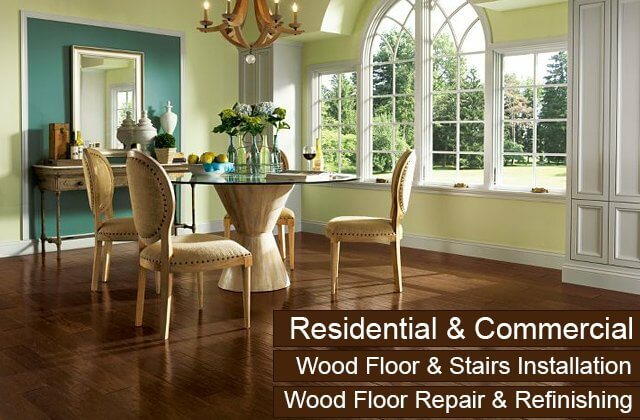 We are trained and authorized to sell and install wood floors by Garrison, Bruce, Robbins, and Mullican. If you live in the Torrance region, call today for expert hardwood flooring sales and installation services from Carter Wood Floors. Our floors are backed by written labor and product warranties. Carter Wood Floors has been Torrance's best choice for high-quality, affordable wood floor repair and board replacement since 1981. With our expertise in wood sanding, staining, and finishing, our flooring experts can expertly repair all types of damage, such as damage caused by water, termites, fire, furniture movers, urine, heels, and improper installation. 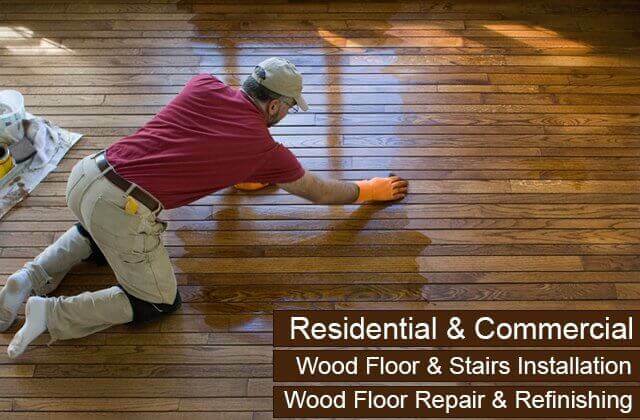 We can repair all types of wood floors, including new and antique floors. Depending upon the extent of the damage, our wood floor repair services may involve small fixes for scratches, cracks, dings, and chips; replacement or a few floorboards; refinishing; and/or complete floor replacement. Basic repairs take about a day, while refinishing can take up to two to four days. Call today for a free floor assessment and price estimate. We welcome jobs of all sizes. 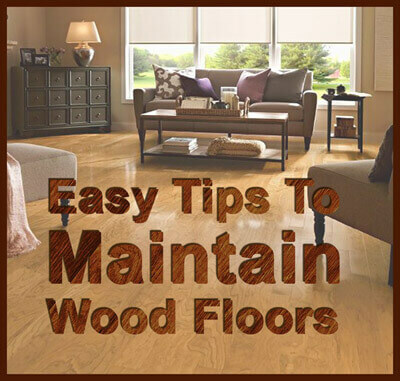 Recoating is one of the most cost-efficient ways to preserve and protect your hardwood floor. Some Torrance homeowners perform this type of preventative maintenance on their own; however, for the best results, you should call the experts. Carter Wood Floors has been recoating floors since 1981 and know through experience which products and techniques to use for optimal wood floor maintenance. We primarily use oil-based and water-based floor finishes from DuraSeal, the company known among the hardwood flooring industry for balancing durability with aesthetic appeal. Before applying, we clean and prep your floor to accept the new coat, and then apply the finish according to the manufacturer's instructions, taking great care to avoid overlaps and drips. 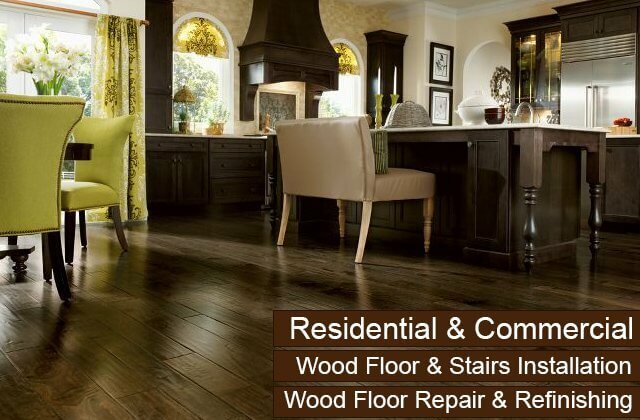 If your floors are starting to look dull, call Carter Wood Floors today. We offer free onsite consultations and estimates to home and business owners in Torrance. Carter Wood Floors is Torrance's best choice for custom hardwood staircase installation and refinishing. We have been renovating staircases for over 30 years and have the level of skill you would expect from craftsmen who solely work with wood. Our hardwood stairs are custom cut to fit each particular staircase, down to every tread and riser, and then expertly stained and finished. Our hardwood installation service is comprehensive, which means that we'll also customize and install the wood for your balusters/spindles and handrails. Balusters and rails are usually made with oak, hickory, or maple, which can be stained or painted any color of your choice. Because of the level of customization that is involved in hardwood installation for stairs, this type of job usually requires three to five days. Additionally, we also offer expert refinishing services for Torrance staircases that have been heavily worn from heavy foot traffic or following years of use or exposure to the sun. Call today for a free consultation. The floors look great, and we appreciate not only your company's work, but also your courteous and professional staff. We definitely will call you again for future work.